Description: No Credit Card Fees. $20Flat rate shipping to your local FFL in the lower 48 states. 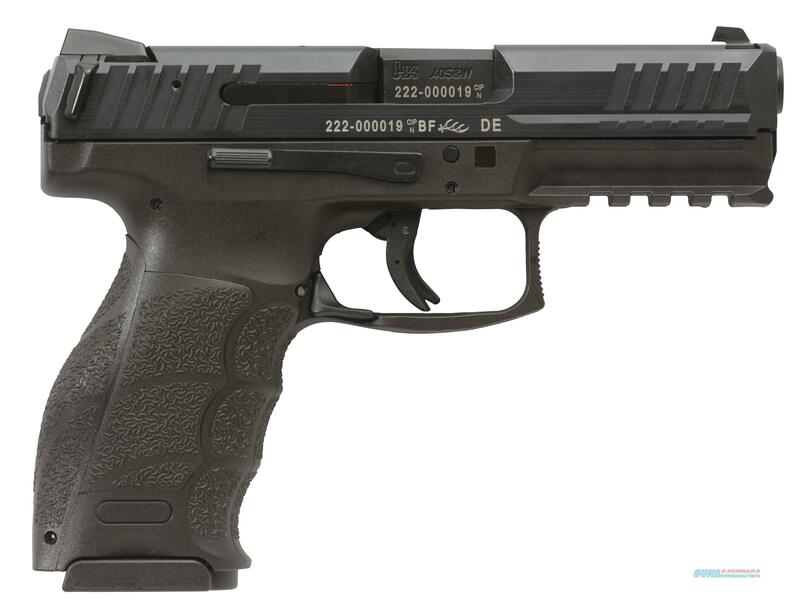 The VP Series is Heckler & Koch's first striker fired HK since the P7 series pistols introduced in the 1980s. It is well-suited for civilian sport shooting, security, military, and law enforcement use. Influenced by HK engineers' experience with the P30 pistol, the VP Series breaks ground with its integration of a unique striker firing system with an enhanced HK "light pull" trigger. The net result is trigger quality unequaled in a production striker fired handgun. The VP trigger has a short, light take-up with a solid, single action type break followed by a short positive reset. The VP40 uses HK's ergonomic handgun grip design that includes three changeable backstraps and six grip side panels, accommodating all hand sizes. Molded finger grooves in the front of the pistol's grip also instinctively position an operator's hand for optimal shooting. An extended Picatinny MIL-STD-1913 rail is molded into the polymer frame for mounting lights and accessories. The rail has been tested and certified to handle mounted accessories up to 5.6 ounces (160 grams). All controls are completely ambidextrous. Slide releases are present on both sides of the frame and the paddle style magazine release can be easily activated by left- or right-handed shooters. VP pistols feature HK's patented charging supports - simple components mounted on each side of the rear of the slide to provide better gripping leverage for racking the slide rearward. The charging supports speed reloading and make operating the VP easier for shooters with reduced hand strength. VP pistols use a proprietary captive flat recoil spring to help reduce the recoil forces, improving shooter control during rapid firing and prolonging component service life. HK's famous cold hammer forged barrel, made from cannon grade steel, also ensures long service life. The polygonal bore profile contributes to longer service life as well as a slight increase in muzzle velocity. The machined steel slide is protected from corrosion and wear by HK's hostile environment finish and all metal components, including springs and pins have superior metallurgy. VP40 pistols use proven HK P30 steel magazines; this model comes with three 13-round capacity magazines and night sights.